Euphorbia 'Diamond Frost' (Euphorbia hypericifolia 'Diamond Frost'): growing, planting, caring. A perennial cultivar of spurge - but cultivated as an annual in temperate climates - with amazing white flowers! 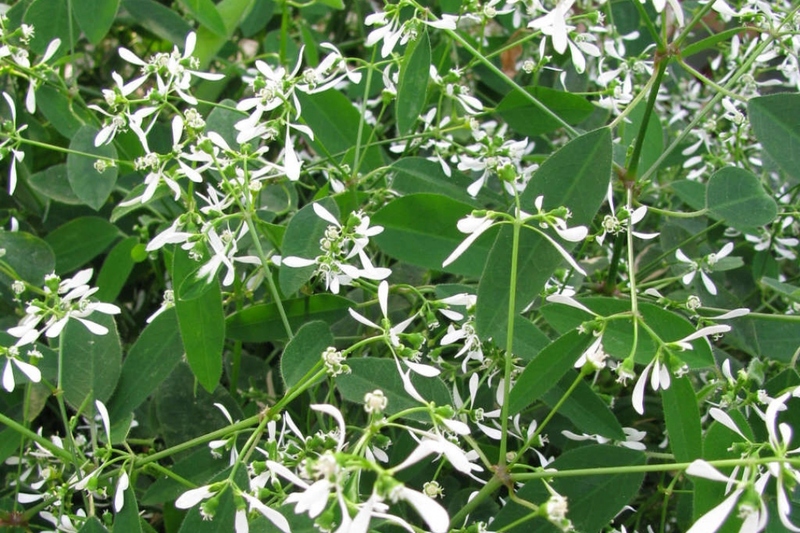 This cultivar is commonly cultivated as an annual in most places, growing 12-20 inches tall with a mounding growth habit and narrow, gray-green to bright green leaves, and a profusion of tiny pure white flowers the canopy from spring to frost. ‘Diamond frost’ is hardy in zones 10-12 and root hardy in colder areas with a little protection. 'Diamond Frost' is an horticultural hybrid obtained in Germany from Euphorbia hypericifolia - also called Chamesyce hypericifolia, a frost-sensitive species native to Colombian forests. It produces thin stems, and quickly forms a rounded tuft that can reach 70 - 80 cm in all directions. The stems bear whole and elongated tender-green leaves, about 2 centimeters long. This variety blooms abundantly and without interruption from mid-April until the first frosts, in very small and innumerable immaculate white flowers. Plant your Euphorbia in a light, porous and well-drained growing medium to prevent water from stagnating at the root level. This variety will be well installed in a large pot of at least 10 liters, or in the ground. Euphorbia need a maximum of light. In pots inside, place them in front of the windows so that they are beautiful even in winter. In winter, they will prefer a cool room. In summer, do not hesitate to take them out if the conditions are favorable. The Diamond Frost spurts with infrequent watering, hates stagnant water, especially in heavy soil. The watering rate varies with the season, as your plant "evaporates" more when it receives a lot of light. How to do it ? You can use tap water or reclaimed water. Water gently, and if you see water in the cup, empty it a few minutes after watering. Diamond Frost spurts can live or survive with very little nutrients! But if you want beautiful vigorous plants, a supply of fertilizer can help. Just use a liquid fertilizer, geranium or tomato fertilizer is fine. The special fertilizer fo cactus is almost identical, but more expensive! Fertilize on every other watering during the growing season. Repot at the beginning of the beautiful days, at the end of the winter rest, right before the resume of the growth. This allows the plant to recover from the inconvenience, and to be ready for a new year. If you missed the moment, it's not very a big problem, you can do it all year! Repot your cacti every 3 or 4 years with potting soil mixed with a lot of sand. Know that the growth is related to the frequency of repotting: a cactus never repotted will stop growing! When repotting, remove the old soil and dead roots as much as possible, while being careful not to damage the larger ones, which are alive. To facilitate drainage, place a layer of coarse sand in the bottom of the pot, or even pebbles for large plants. Once the repotting is complete, wait one to two weeks to resume watering, so that the damaged roots heal. Otherwise, there is a risk of rottening the plant. The low hardiness (-1 ° C) of this spurge is not a huge problem: it is quite possible to preserve it during winter in a luminous conservatory, if you reduce watering considerably - once a month - to allow it to rest. Before you take it out in spring, prune it slightly, repot and gently resume watering! Do not hesitate to take out your euphorbia for the summer! If it has spent the winter in the shade, just avoid placing it directly in full sun, acclimate it slowly ... You should shelter it back at the end of the summer. Diamond Frost spurts multiply very well by cuttings. Cut a 10 cm section in the spring. Choose a stem that is quite tender, neither too old nor too young and without any trace of disease. Also make sure not to make the mother plant unsightly! With a very sharp knife, select a piece of stem or leaf, at a joint. Put some water on the scar, it causes the coagulation of the latex ;-) Leave the cutting outdoors, in a warm place, to dry for a few days. Then put them in a terracotta pot, with a very light mixture composed of a third of potting soil or peat and two thirds of sand. Water then place the pot in a mini-greenhouse, at a temperature of 15 to 18 ° C, in a well-lit place, maintaining heat and humidity.